Golden and fresh, this floral fragrance infused with pear, wrapped with soft woods, a reminiscent of the perfect sunny & bright day. 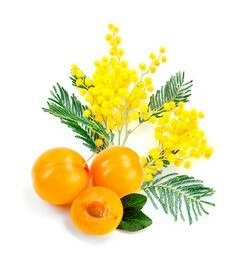 Springtime recreated with a bright, blooming blend of Golden Mimosa and Yellow plum. This fresh essence is accented with delicate notes of Honeysuckle, Sweet Bartlett Pear and a subtle touch of soft woods. Aqua/Water/Eau, Trideceth-9, PEG-40 Hydrogenated Castor Oil, Glycerin, Parfum/Fragrance, Panthenol, Tocopheryl Acetate, Phenoxyethanol, Sodium Citrate, Anise Alcohol, Benzyl Salicylate, Citral, Citronellol, Limonene, Yellow 5 (CI 19140).